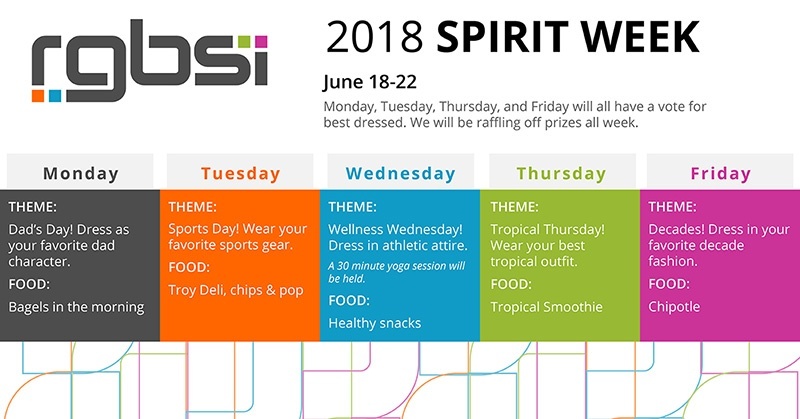 We are excited about our upcoming employee spirit week occurring June 18-22! Monday, Tuesday, Thursday, and Friday will all have a vote for best dressed. We will be raffling off prizes all week. Theme: Dad's Day! Dress as your favorite dad character. Theme: Sports Day! Wear your favorite sports gear. Theme: Wellness Wednesday! Dress in athletic attire. A 30 minute yoga session will be held. Theme: Tropical Thursday! Wear your best tropical outfit. Theme: Decades! Dress in your favorite decade fashion.